Cling Stamp from Impression Obsession featuring the sentiment "May your days be merry & bright". Cling Stamp from Impression Obsession featuring the sentiment "No matter what never never never give up on your dreams". Clear stamps from Picket Fence Studios featuring flowers and the sentiments "Smile", "You are the light of my life", "My one and only", and "Beautiful inside and out". Unique, beautiful and creative stamps designed by Nicole Petersen. Use with paints and inks. Perfect for card making, journaling, scrapbooking, and mixed media. Cling Stamp from Impression Obsession featuring the sentiments "Snowmen fall from heaven un-assembled". Part of the Girlfriends 2014 release from Art Impressions, this unmounted stamp features the humorous phrase "Wine a bit... you'll feel better". 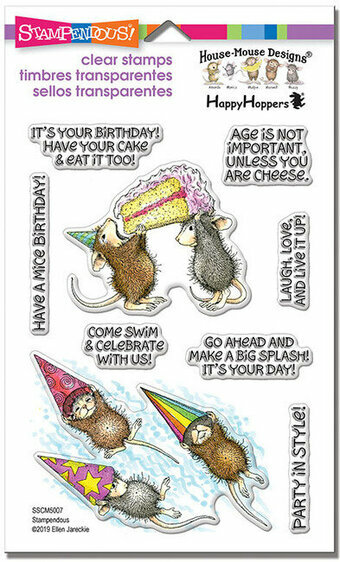 House Mouse stamp from Stampendous featuring party mice swimming, eating cake, and the sentiments "it's your birthday! you can have your cake and eat it too", "have a nice birthday", "age is not important, unless you are cheese", "laugh, love, and live it up", "come swim and celebrate with us", "go ahead and make a big splash! it's your day! ", "party in style!" 9 stamps. Cling Stamp from Impression Obsession featuring the sentiment "Christmas bells are ringing..."
Tell your friends how much you value each day with them using Dovecraft's endearing clear stamp design. With the phrase, "Friendship isn't a big thing, it's a million little things" designed in a range of fonts, this eye catching stamp will make a fantastic centre piece on your handmade crafts. Made in the UK using quality Photopolymer gel for a crisper image print. Cling Stamp from Impression Obsession featuring the quote "Every leaf speaks bliss to me, fluttering from the Autumn tree - Emily Bronte". Travel and vacation themed Hero Arts clear stamps featuring an airplane, a helicopter, and the sentiments "Fly High", "Imagine the places you'll go", "You were born to fly", "Let your dreams take flight", and "A grand adventure is about to begin". Hero Arts 4" x 6" clear stamp sets offer the best quality in the market. They are made in the USA from genuine photopolymer, which is non-toxic, biodegradable, and designed specifically to transfer ink to paper for a true impression every time. Peel off your stamp from its backing and stick to an acrylic block for easy positioning. Mix and match the designs, then clean with water or stamp cleaner. "Get some rest, I'll be back every 3.2 minutes." 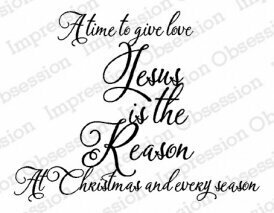 Stamp Dimensions: 1 1/2" W X 3/4" H.
Impression Obsession cling stamp featuring the Christian sentiment "A time to give love. Jesus is the reason at Christmas and every season." Birthday themed set of stamps from Art Impressions featuring the sentiment "You're only young once but you can be immature for a lifetime". Cling rubber stamp featuring mountains. These detailed stamps are the perfect way to add fun images to your cards, scrapbook pages and more! Use with any clear acrylic block. 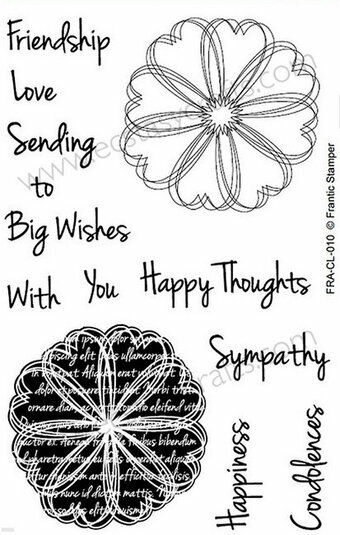 Clear stamps featuring flowers and the sentiments "Friendship", "Love", "Big Wishes", "Happy Thoughts", "Sympathy", "Condolences", and "Happiness". A 4"x6" set of clear stamps, made of the highest quality, non-yellowing polymer. Our clear stamps are proudly made in the USA. This set includes 13 clear stamps (including 2 large scribble flowers and 11 words & phrases). Use this clear stamp set alone, or combine with the Frantic Stamper Precision Die set: "Scribble Flower Base and Leaf" (FRA9558). The die set contains an outline die that will cut both of the flower stamps perfectly leaving a slight white border. Impression Obsession cling stamp featuring the sentiment "Take time to delight in sweet simple things". Kaisercraft Clear Stamp featuring the sentiment "Together Forever" -- perfect for weddings and anniversaries. Clear stamps featuring a city street and the sentiments "Happy Birthday", "A day with you in the city was simply amazing", and "Make today an adventure". Clear stamp set from Stampendous featuring the inspirational sentiments "best day ever", "family makes a house a home", "thank you for the special gift", "love grows here", "happy birthday to you! ", "choose joy", "thinking of you my friend", "simply blessed", "enjoy the little things", "the best things in life aren't things". 10 stamps. This Large 4" X 6" set of Perfectly Clear Stamps features premium photopolymer images from exclusive Fran Seiford artwork. Interactive images work together for dozens of fun looks. Clear Stamp from Impression Obsession featuring the inspirational sentiment "wherever life plants you, bloom with grace." Cling Stamp from Impression Obsession featuring the sentiment "Just To Brighten Your Day". 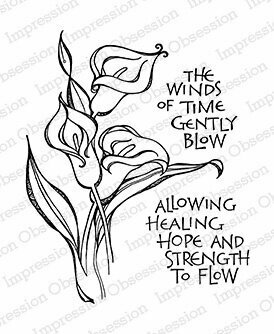 Cling Stamp from Impression Obsession featuring Calla Lily flowers and the sentiment "The winds of time gently blow, allowing healing hope and strength to flow". Penny Black clear stamp featuring the sentiments "You are Amazing", "Cheers", and "Well Done". This clear stamp features a woman in a bee costume, bee holding an ornament, three caroling bees, tree, poinsettia, hexagons, beehive, and a variety of sentiments! "Wishing you a Bee-utiful Christmas" "O Christmas Bee, O Christmas Bee" "Merry Christmas Honey" "I wanna bee in your arms this Christmas" "I'll bee home for Christmas" Bee "Merry" with a bow, "May the Joy of Christmas bee yours" Includes 15 pieces. Cling Stamp from Impression Obsession featuring the sentiment "Come... let us adore Him". Cling Stamp from Impression Obsession featuring the sentiment "Do You Know How Loved You Are?" Love themed Impression Obsession cling stamp featuring the sentiment "You're My Favorite Husband". 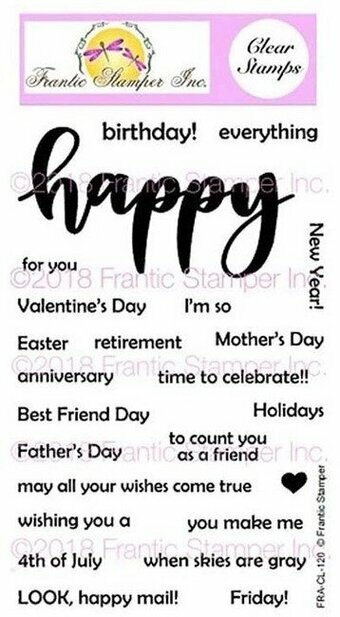 A 4"x6" clear stamp set containing a large "happy" word stamp (3.125" x 1.55") which matches perfectly with the Giant Layered Happy die set (FRA10594) as well as several sentiments in simple, easy to read font. You'll have the perfect sentiment for wishing someone a: Happy Birthday, Happy Anniversary, Happy Mother's Day, Happy Father's Day, Happy Friday, Happy retirement, or even Happy everything! You also get accompanying phrases such as: time to celebrate, to count you as a friend, wishing you a, you make me, and so many more! Clear stamp set featuring guinea pig with wings, guinea pigs eating cake, walking guinea pig, pellets, and sentiments "It's your birthday pig out!" "We'll admit we're old when pigs fly!" "Hap-pig birthday" "Hello from the pellet factory" "Sending you a grinny pig to brighten your day" "It's guinea be a great day!" Halloween themed Cling Stamp from Impression Obsession featuring the sentiment "May all your Halloween witches come true". 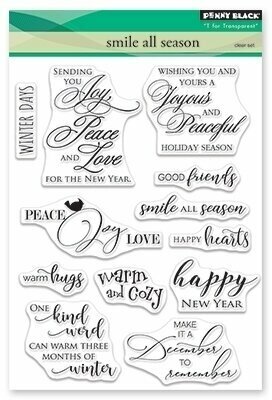 Winter themed clear stamps from Picket Fence Studios featuring a snowman and the sentiments "If snowflakes were kisses I'd send you a blizzard", "Merry everything and a happy always", and more. Unique, beautiful and creative stamps designed by Nicole Petersen. Use with paints and inks. Perfect for card making, journaling, scrapbooking, and mixed media. If you love the whimsy of a modern calligraphy style, the Heart Art stamp set will give you all the heart eyes. This collection of six images features a variety of sweet greetings - each showcased within a simple heart shape. These images fit within the openings of the Heart Trio Shaker Window Die-namics as well as the Mini Heart Shaker Window & Frame Die-namics for even more design possibilities. Clear stamp sets include the name of the set on the sticker for easy identification. Love should always be in the air, and with the Heartfelt Love Sentiments Cling Stamp Set spreading around loved themed and encouraging well wishes is easy! 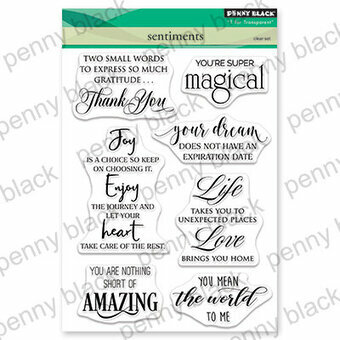 Filled with so many wonderful, positive and uplifting sentiments, this stamp assembling is perfect to let others know you care about them and hold them close to your heart! 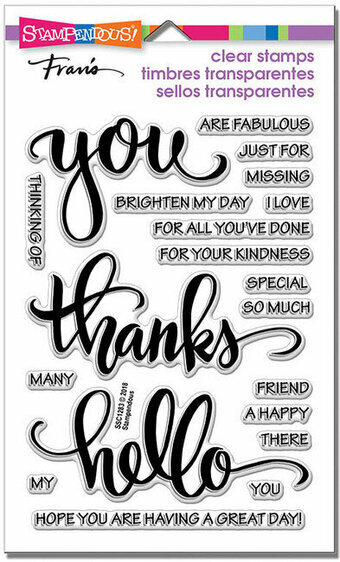 A wonderful compilation of beautifully scripted sentiments ideal to round out the love section in your sentiment collection! This cling stamp set is part of the Heartfelt Love Collection. Approximate Image Sizes: 1. Wonderful Day Sentiment: 2.0" x 1.0", 2. Because I Care Sentiment 1: 1.5" x 1.0", 3. Because I Care Sentiment 2: 2.0" x 0.25", 4. Love and Chocolate Sentiment: 2.5" x 1.5", 5. I Love You Sentiment 1: 1.75" x 0.75", 6. I Love You Sentiment 2: 1.25" x 1.5", 7. Happy Valentine's Day Sentiment: 2.0" x 1.25", 8. Gift from Heart Sentiment: 1.5" x 2.0", 9. Hey Gorgeous Sentiment: 2.25" x .5". These cling stamps are ready to use with Acrylic Blocks. Included with stamp set: 1. Storage panel for use with a two or three ring binder, 2. Stamp packaging can also be used as a storage box for the stamp(s). A little bit jaunty and a lot bit jolly - here comes Santa Claus and after a year of rest, he's ready for action! Choose from a sack-bearing Santa, present-piling Santa, or Santa-in flight and then complete the scene with accessory images like a stack of gifts and a cozy little elf hut. And we all know old St. Nick would be lost without his trusty reindeer so we've included one of those as well. Send some Christmas cheer with this charming collection. Clear stamp sets include the name of the set on the sticker for easy identification. Love themed Impression Obsession cling stamp featuring the sentiment "Hugs and Kisses Make the Best Gifts". 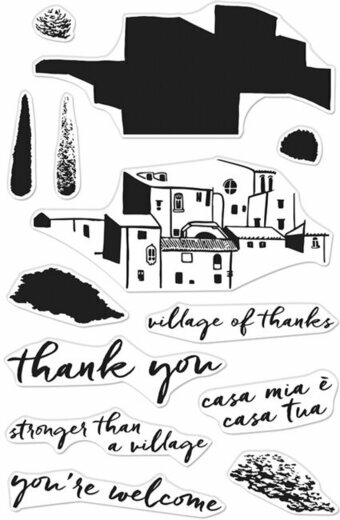 Cling Stamp from Impression Obsession featuring the sentiment "In all things give thanks". 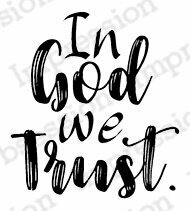 Cling Stamp from Impression Obsession featuring the sentiment "In God We Trust". Christmas themed Penny Black clear stamp featuring the sentiments "Merry everything, happy always", "Wishing you peace", "Warmest wishes for a wonderful Christmas", and more. Laurel Burch stamp from Stampendous featuring hummingbirds, flowers, and the inspirational sentiments "gather wild flowers", "drink moonlight", "dream laugh sing", "pretend you have wishes and use them". Made in the USA. 10 pieces. These angelic characters are heaven sent and ready to grace your cards through the holiday season and beyond with their sweetness and light. In various stages of flight and boasting beautiful wings, they offer a charming focal point for cards and tags. Whether you're thinking of a personal guardian angel, crafting a holiday wish, or thanking someone for being particularly wonderful, Little Angels provides an ideal start. Clear stamp sets include the name of the set on the sticker for easy identification. Love themed clear stamps featuring the sentiments "You are loved", "Happy Valentine's Day", "Forever and Ever", and "Love you so much". This is a clear photopolymer stamp set measuring 4 x 6 inches. Our clear stamps are made in the USA from the highest quality photopolymer. "Main Squeeze" is a 4 x 6" set containing 7 individual stamps; 5 images and 2 sentiments. 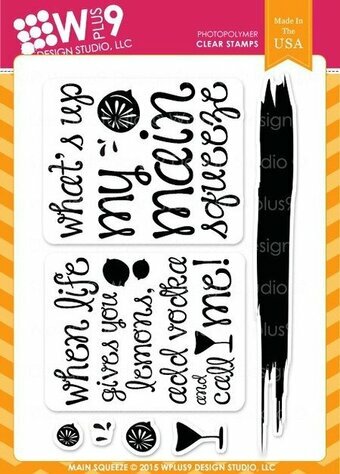 Features the humorous sentiment "When life gives you lemons, add vodka and call me". Approx. Measurements: paint stripe - 5 1/2 x 1/2", sentiments - 2 1/4 x 2 3/4", lemons - 1/2" and 1/4", martini glass - 1/2 x 3/4". Clear Stamp from Impression Obsession featuring the life sentiment "life is what happens when you're busy making plans." This multi-step stamp set is ideal for creating playful and colorful scenes without pulling out pencils, markers, or watercolors - perfect for quick and easy cards! Each two-step penguin includes a body layer and separate beak/feet layeryou'll have a trio of dapper partiers in no time flat! Create a full scene with the two-step cupcake and party hats as well as the solid balloon, confetti, and streamer options. Five sentiments and a banner element complete this festive group. Clear stamp sets include the name of the set on the sticker for easy identification. Cling Stamp from Impression Obsession featuring the quote "Pleasant words are as honeycomb, sweet to the soul - Proverbs 16:24". Clear stamps featuring the sentiments "Take Care", "It's the little things that make life big", "I am always here", "You are so talented", and "Thank you for making me feel good about myself".